As we know, voicemail have limited storage space and usually we will just discard the old record. Perhaps, you would like to keep or share a meaningful voicemail from your loved one or family member. Now you can do it. The new released iOS 9 able to share and save any lovely or hilarious voicemail directly from your phone app via email, Voice Memo app, text message, the Notes app or any others third party app which support .m4a files including Evernote, Dropbox. Launch Phone app and search for the Voicemail tab which is at the bottom right corner. Now, you can see a list view of all your voicemail history. Click the voicemail message that you’d like to save. Then tab on share button . 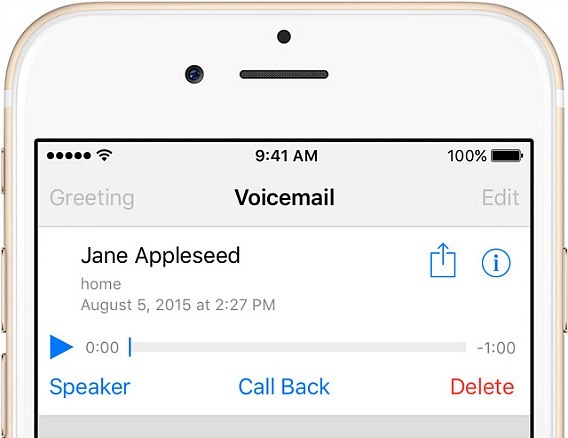 Select Notes or Voice Memos to save your voicemail message. Now, you can see a list view of all your voicemail history. Click the voicemail message that you’d like to share. Then tab on share button . Select where to share the voicemail message. You can send it as message, attached to your email or share the Voicemail by tapping an AirDrop contact.